A farmer came into town and asked the owner of a restaurant if he could use a million frog legs. The restaurant owner was shocked and asked the man where he could get so many frog legs! 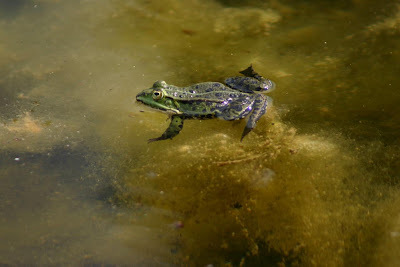 The farmer replied, There is a pond near my house that is full of frogs - millions of them. They all croak all night long and they are about to make me crazy! So the restaurant Owner and the farmer made an agreement that the farmer would deliver frogs to the restaurant, five hundred at a time for the next several weeks. The first week, the farmer returned to the restaurant looking rather sheepish, with two scrawny little frogs. The restaurant owner said, Well... where are all the frogs. The farmer said, I was mistaken. There were only these two frogs in the pond. But they sure were making a lot of noise! Next time you hear somebody criticizing or making fun of you, remember, it's probably just a couple of noisy frogs. Also remember that problems always seem bigger in the dark. Have you ever laid in your bed at night worrying about things which seem almost overwhelming like a million frogs croaking. Chances are pretty good that when the morning comes, and you take a closer look, you'll wonder what all the fuss was about.